I’ve been waiting and looking forward to the first big basketball game of the season. With this schedule, I didn’t have to wait long. Our Cardinals will play a pretty good Volunteers team here in about an hour as part of the NIT Season Tip-Off from the Barclays Center. Louisville has won the last 5 matchups against the Vols. I think the biggest challenge for the Cardinals tonight will be how well they have learned the new defense. Will they be able to stay disciplined enough at this point in the season and stay out of foul trouble. We don’t have the bodies for foul trouble. This Tennessee team moves the ball really well and they do a great job at finding the open man. They are 14th nationally with 20.7 assists per game. Hope our guys are ready. Scoring hasn’t been an issue for our guys either with four players Nwora, Perry, Enoch, and VJ all averaging double figures. This is a very offensive oriented Louisville team with 3-point shooting big men and all. The versatility of Malik and Steven could pay off tonight. They can stretch a defense. Nwora leads the Cardinals with 18 points and 6 rebounds per game while Ryan Mack leads Louisville with 3 assists per game. Ryan makes good things happen when he’s in the game. His Basketball IQ is off the charts. 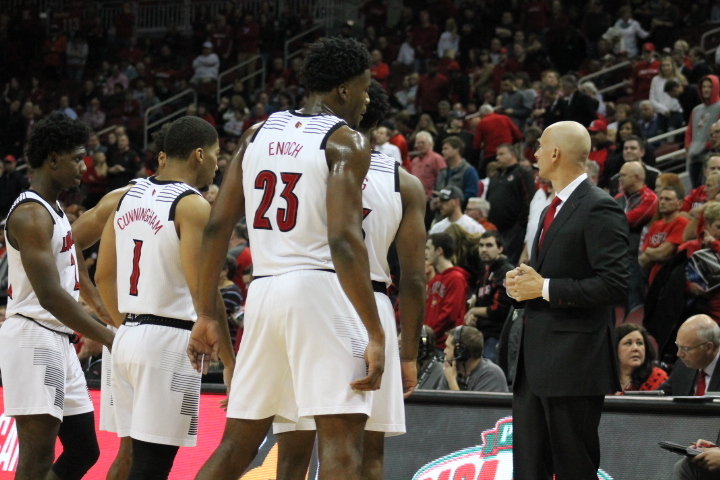 As a team, the Cardinals are averaging 91.7 points per game on 53.5% shooting from the field, 37.3% from behind the 3-point line and an impressive 78% from the foul line this season. Getting to the foul line will be big tonight. It won’t be just a game of horse for Louisville. This Tennessee team’s defense is some of the best in the country. They held the Yellow Jackets to just 53 points in their last game, which is their average in terms of points against this season. The Volunteers are ranked 4th in the nation in field goal defense. This Louisville team has been prone to turn the ball over and take a bad shot. Can’t do that against this Vols team. Cards have to make every possession count. I’m super optimistic. If our guys don’t let the bright lights get to them I think they win this game. I’ve said it 20 times just this week. Coach Mack is for real. And this team thru about 8 guys deep can run with anyone in college basketball. I really believe that. This team has been working hard and are walking with a different swagger. That will pay off tonight. This entry was posted in THE BEAK POST GAME REPORT by ru4uofl. Bookmark the permalink.